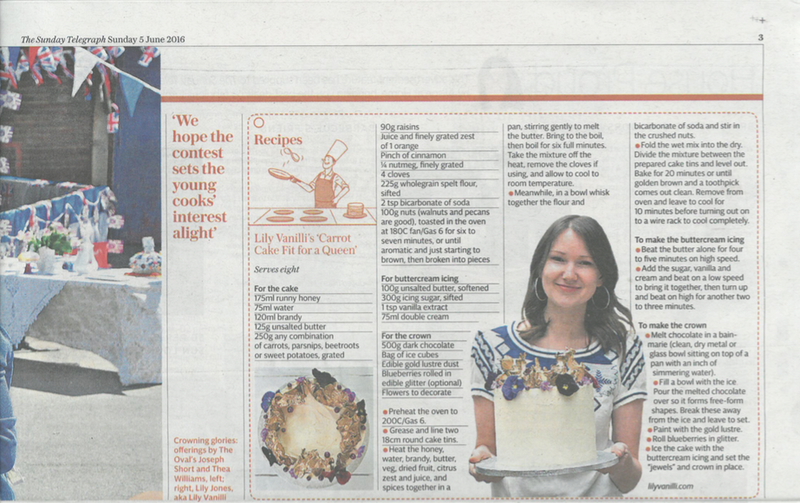 This week’s Telegraph features the cake I made to celebrate the Queen’s 90th birthday. Along with Cherish Finden and Frances Quinn, they asked me to design a cake fit for the royal birthday celebrations. 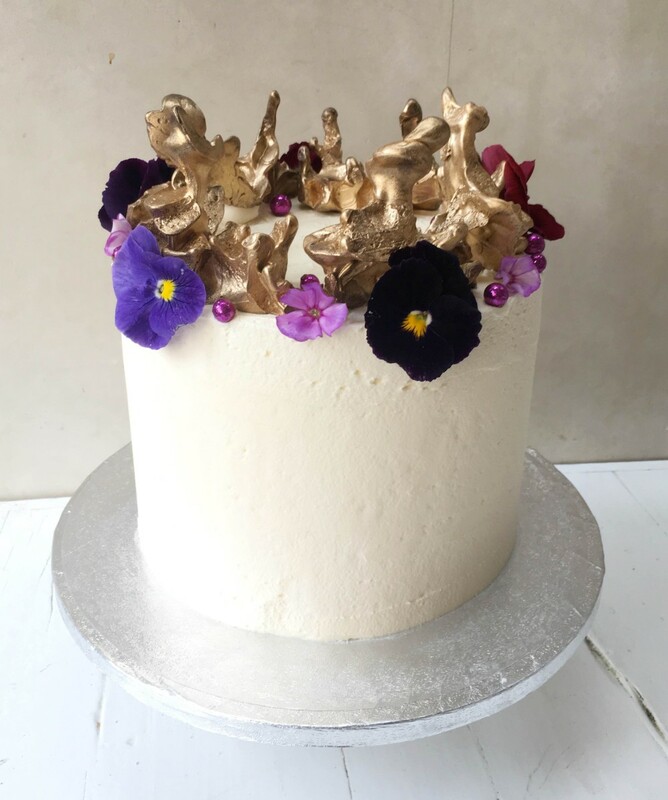 I chose a delicious root cake with brandy and spices, decorated with buttercream icing and created an edible crown to go on top using gold-painted freeform chocolate shapes and our signature glitter berries as jewels. Here’s the recipe if you’d like to make one of your own! A batch of vanilla buttercream or cream cheese icing – use any recipe you like, there’s a nice one on my website, here. 1) Preheat the oven to 180°C fan assisted/gas mark 6. 2) Heat the honey, water, brandy, butter, veg, dried fruit, citrus zest and juice, and spices together in a pan, stirring gently to melt the butter. Bring to the boil, then boil for 6 full minutes. Take the mixture off the heat, remove the cloves if using, and allow to cool completely to room temperature – transfer to another bowl to speed up this process. 3) Meanwhile, in a bowl whisk together the flour and bicarbonate of soda and stir in the crushed nuts. 4) Fold the wet mix into the dry. Divide the mixture between the two prepared cake tins and level out to the edges. Bake for 20 minutes, or until golden brown and a toothpick comes out clean. Remove from the oven and leave to cool in the tins for 10 minutes before turning out on to a wire rack to cool completely. Melt your chocolate in a bain marie (clean, dry metal or glass bowl sitting on top of a pan with an inch of simmering water).